Subject: Hello from Peter Diamandis, Welcome to Space! Welcome to your ISS Home! Earth watched your beautiful launch on the Internet and TV. You looked great… all smiles the entire time! Here’s my blog entry of your launch (how it looked from NASA TV). You were on my mind the entire time. I remembered our first meeting with you sitting across the table and passionately talking about goals of the X Prize foundation. I was enjoying watching you make a sales pitch with such a passion. You had me sold from the first minute but your passion was contagious and I wanted you to finish telling your story. I arrived in the station a few hours ago and it feels like home. I have been making notes all along the launch and I will be posting a blog on the trip. The Earth is so beautiful and if we could all see it this way I’m sure we would do everything in our power to preserve it. I truly hope that more and more people get to experience this trip first hand. But more than anyone else I hope that you will experience this trip soon, because I cannot think of a more deserving person…. salam anooshe jan.hatman hala ke toye ooje arezoot hasti va be oon residi kheyli ehsase khbi dari ke ma dark nemikonim khosh be halet ke in shans ro dashti ke ghabl az marg ye bar az in donya rafti va be koochiki donya va bozorgie khoda pey bordi adam vaghti bemire har ghadr talash kone nemitone dobare be in donya bargarde va on moghe taze be fekre kar haei ke dar dorane omresh karde fekr mikone ama afsoos ke rahe bargasht nadare ama to onja hatman kheyli be azemate donya va khoda fekr mikoni to hala mitoni fekr koni be chand ta az vajebati ke khoda toye hamoon ghorani ke hamrahet bordi gofte amal nakardi dar sorati ke khoda bozorgtarin arezoye to ro bar avorde kard pas to kheyli be khoda bedehkari ama hanooz dir nashode to rahe bargash dari va mitoni jobrane 40 sale gozashte ro bekoni khoda montazerete ke bedehi sho bebi pas zood bash chon khoda ham zood arezoye to ro bar avarde kard.bye. Very poweful text,I love you anoushe!!! Your flight is inspiring millions of people around the world. Your path is really shining others path who graduate college and pursue career and then to accomplish such a great task in different way. Believe me a lot’s of people very proud of you. Have a cool time on ISS!!! More good looking for earth and safe return! It was so interesting to watch the coverage of your preparation for launch…and the very permanent grin on your face! I am so happy for you. Tell us about the time before docking…is it as small in the capsule as it looks from the onboard camera? Can you stretch your legs at all? Tell us everything! I and the rest of your fellow XPF board members hope (and know) you will have a great time. تلاش در راه صلح جهاني يكي از آرزوهاي منه. Anousheh, thank you just to exist !!!! As a (tiny) supporter of the Xprize and as a space enthusiast I wish you all the very best !!! Words fail me to describe the temper, the strength, the imagination, the power, in one word the beauty that you simply radiates around. One can’t even be envious because knowing who You are You sure deserved every moment of the dream You’re living. You’re a hope and a relief to us all. Thanks again…. az roozi ke khabare raftane shoma be faza ro shenidam ta be emrooz,tamame modat,har rooz be shoma fek mikonam va hame ja az shoma harf mizanam.har bar be internet miam,faghat miam soraghe webloge shoma va site hayee ke dar morede shoma neveshtan.bish az pish be faza alaghemand shodam va montazeram ke shoma bargardin be zamin va natijeye tahghighatetoon ro bebinam.tosifhaye shoma az zamin baes shode shogham baraye didane zamin az door chand barabar beshe.omidvaram in modat ke dar ISS hastin ro be behtarin shekli ke doost darid begzaroonid va salem va movafagh be zamin bargardin. On the third day, we all pointed to our continents…. I just heared first time today about you, and exploring your great website for hours. We will try our best to preserve this earth as you looked from the sky. I am full of energy these days. Your words ignited my passion to make a world as a better place to live, and I do my best to do it. This is Arash,a medical doctor from Iran.i wish you the best in the space.I hope after getting back from space you(as a representative of iranian people too) will dedicate the message of love and friendship of iranian people to the world despite the ideology of hatred which is being supported and expanded by some guys from inside iran.they are not the real represeantatives of iranian people in international scenes .you probably can realise who i do mean. Now in the blog’s world, we can say that there was a post which is come from furest plase to the net. And also, it is fantastic that kind of log. anyway, Peter, Could you send this message that Anousheh will send a photo of Earth from her point of view, and then you post it on her logs. It`s Babak From a HRD Expert from Iran. all of Persian wish you all the best thing espcially that you are out of earth. i hope U best & best. Mr. Arash, maybe this is not the most suitable place… but thank you to exist, too. Hi anuosheh, im Sara and mail you from Iran.i enjoy your words.it is very exiting and attractive for all of the people in the world.i wish you the best in space.you are so uniqe!!! سلام.خوشحالم که به سلامت به ایستگاه رسیدین .این دوروز رو مشتاقانه منتظر خوندن اولین پست شما بودم.امیدوارم سرفرصت بیشتر برای ما زمینی ها از اون بالا بنویسید.سفرتون سلامت. wow. It looks great. We pray and pray for you to have the safest trip. امیدوارم همیشه سربلند باشید و از این سفر به یاد ماندنی به سلامت برگردید. هیجان انگیزه که دارم برای اولین فضانورد زن تاریخ – که اتفاقا” هم وطن هم هست مینویسم. مطمئنم که دیدن زمین از اون بالا باید خیلی هیجان انگیز باشه. و افتخار میکنم که در این شرایط که متاسفانه اسم ایران در دنیا با خبر ها و ویژگیهای نه چندان مثبت associate شده تو جنبه مثبت قشنگی رو به این مجموعه اضافه میکنی. و لذت میبرم از اینکه میبینم مصداق قشنگی هستی از اینکه آنچه که بخواهیم امکان پذیره. This is the first blogpost from space I’ve ever read! It was a great pleasure! Thanks! By the way, did you know you’ve beaten the famous blogger Robert Scoble on WordPress in just a few weeks of blogging?! You’re probably the fastest-growing blogger! Congrats! salam.khosh halam avalin monadi solh dar faza aval yak irane va sapas yak zane irane ast.ba fazaieh solh va doste khosh amade. It’s a beautiful day !!! 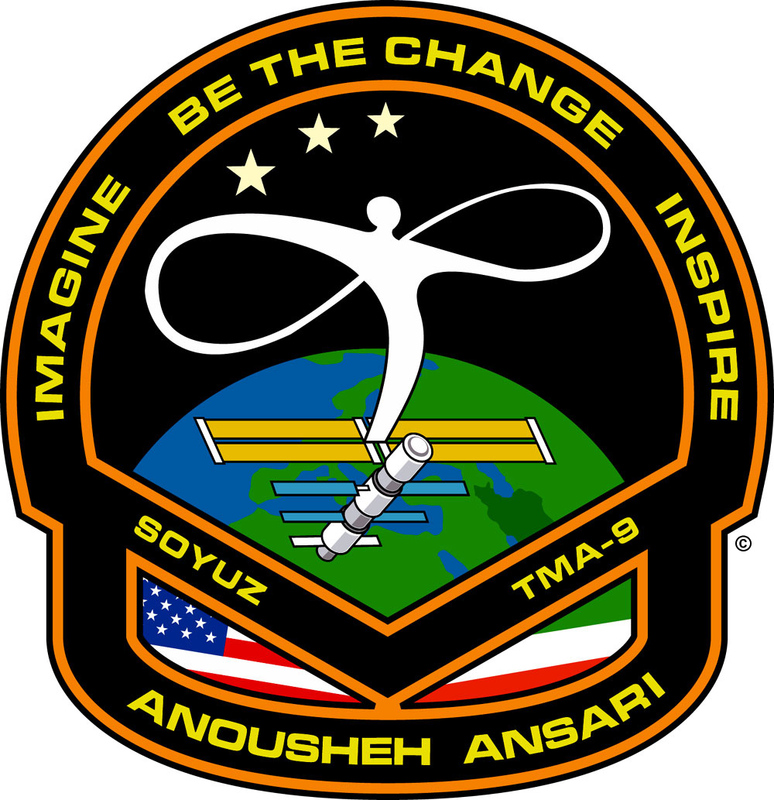 Dear Anousheh – I must confess, I’m addicted..
Congratulations and I’m sure, you will enjoy every minute up there..
BTW: I like your personal mission patch very much and have it now in my office.. I like the message.. I also have a set of high quality photo prints from you on the wall too and whenever I’m asked, I tell how a dream can come true. If I can manage it, I will try to come to Santa Cruz and hope to have a chance to meet you. Indeed, hoping someone might be interested in AMSAT-DL’s dream for the first private satellite mission to Mars. you magnify them in a good way. 2. millions of people are proud of you. 3. although you sad, that their is no politcal backgound on this trip, i am positiv that this could be one of the steps towards a more opened society in iran! 4. people thank you because of you just being you, and this is really a goodfull thing. Just keep going like this, and help people across the world to see the “light”! Whe i was 20 i wanted to be a space-man. You have get yourself the best present you can. Look and remind all the time. I just watched the news and heard that you had a safe journey and arrived in good shape at the ISS. I’m so happy for you. I too dream of going to space sometime. I have been following the news about you ever since I heard about the X-Prize. I am 17 years old, my mother is Iranian like you (my dad is Lebanese). I was born in Washington DC and now live in Belgium. I have been passionate about space forever, and participated in a NASA youth contest aimed at building a permanent human settlement in space. My paper won the NASA Grand Prize last April and they invited me over to meet astronauts and visit the Ames Research Center in CA. It was an unforgettable experience, like your current trip must be. You are an inspiration to many people like me. Your vision and determination are unbelievable. May Allah give you more life and strenghth to guide the next Generation. Into the most POSITIVE Endeaver of LIFE to explore the limitless creations of God, the Almughty. Your each step ahead hereonwards is going to bring our whole Humanity into GOOD senses and close to each other. For us you are an icon of PEACE and INSOIRATION. CONGRATULATIONS. Your fans: feroz, shabnam, altamash, sara, and my all freids and relatives in India and Saudia. Congratulations from Sweden! You are inspiring many people down here as well. I hope private initiatives will finally open up space to more people. I am an Iranian telecom engineer living in VA. We are all so proud of you for what you have accomplished and we admire you that inspite of all the pressure, you still took the Iranian flag to ISS and proudly mentioned to be an Iranian. Message of peace is something beyond the borders. You have inspired so many women in Iran and all around the world. May god bless you & your family. salam omidvaam movaffag bashe va chshme doshmanane iran kur . I do not know how to start, I have being staring at my Spaceship model and thinking about you; it has been phenomenon to see what you’ve done. You have made your countrymen very proud. I am looking at my 7yr old daughter Artemis, and see you in her future. God bless you for your passion and will. Please kiss my planet Earth and tell her thank you for being a good mother and being the ONLY place in universe that could give us LIFE. Anousheh jan, enjoy your time in peace up in universe and thank you again. We should all be there with you by now. Most of us have The Dream and the brains to make it happen. The Human race needs to grow up and get out there. It does not make sence that we elect people that act like kids and teenagers. As you can see from your window, we all live under the same sky and same sun. If we were to put all the money allocated to killing and destroying this beautiful jewell to a real space exploration international program, together we can reach the stars. Enjoy this place of Peace away from it all. First of all, a huge congratulations to you for all the hard work you have done to reach that point you are now, and I hope you’ll enjoy your all scientific mission, and I am eagerly waiting to see more of these from you and your hardworking family. I know you since I was following X-Prize and then you came and boosted the project so that encouraged people to make it happen. Since then I was watching you to see how you will finally get into space and this is it, you have reached this dream and I guess it is time to think of a new and bigger dream, and I am sure whatever it be, you will make it as well. I also want to use this position to reach you about another space related project, as my efforts to contact you or Mr. Ansari in the past monthes weren’t successfull. I am an small participant to Project SETI (you know, http://www.seti.org) and a few monthes ago all participants received a mail from Dr. Arthur C. Clarke (again you know him for sure) stating that the SETI needs donations (the total was below $800K I guess) to be able to continue the project. So I thought, your family with all that space ambitions and the money might be able to help them out, but my contacts with Prodea didn’t help as you were in the trainings in Moscow, and the support staff didn’t provide me any direct contact email address. So, I guess this comments might be read by a close relative of you, and if I am lucky, even by you, and you are the one who can help them, so please try to contact the SETI project to see if you can help or can raise donations for them. Sorry for such a huge comment, keep the good work, and it will be nice to read something back from you. I’s like to take a minute and tell you how thankful I am, that there are people out there that Dream things up like the Ansari XPrize. I’m positive that because of that, Space travel will be a lot closer than people have dreamed of. I’m estatic to be alive during this time. I Wish you a safe trip, Enjoy it, Soak it in, and Keep every part of it. I’m positive it’s Money well spent. Your living the dream. Congrats from Guelph, ON Canada. salam garme man ro az shomale sarsabz az tarafe tamamie iranian bepazir.az samime ghalb barat aarezooye kamyabi mikonam. سلام گرم من رو از شمال سرسبز ايران از طرف تمام ايرانيان بپذير.از صميم قلب برات آرزوي كاميابي مي كنم. I am so proud of you. Your dream is shared by millions. Savor every moment and never stop looking out that window. Take as many photos as you can, because before too long, you will be back home. I hope to see you soon back in Dallas, but please know that your journey is uniting people of all ages, genders, and nationalities and is making a difference. God bless you and safe travels. I am sure humanity is proud that people like you exist. You are source of inspiration and a beutiful example of how excellent a human being can be. I am an airline pilot who never gets tired to enjoy the views of our planet from the air, I just can imagine how you are enjoying those views of our lovely Earth from space! Thank you for sharing your unique and wonderful experience and God bless you and your family. May your voyage continue to be as inspiting to all who look beyond Earth, as it has been to yourself. Wow, how cool! Can you take some pictures of what it looks like inside the ISS and post them up here? Congratulations on your wonderful achievement. Have a great and safe time on the ISS. I hope every thing is as you expected over there! I just want to say Hio and ask a simple question, when you look at the earth from sky, which point makes your heart beat more ? Congrats from ANU, ACT Australia. I was telling my 9 year old daugther, how you have made a history. I am an environmental policy researcher and concerned about sustainability of our planet. Should you have similar concerns, or have any message from the space – how beautiful the Earth is! and to insist others to save the planet? Come home safe, and tell your mum the story! I searched about human knowledge for 5 years.the result of my researches caused to the mathematical model that can describe the human’s beheaviours.based on this model I predict that our feeling from the critical poins of our life(very positive and very negative) can be controled better by our nervous system when we have a low feeling from our weight.in the other word “the feeling of our weight has the inversed relation with our ability to control our nervous reaction at the critical points of our life”. you can imagine some uncontrolled reactions that you had in your life at the space,and then try to find your ability to control your.I predict that you can control your reactions better than when you were in the earth.and this in because of your feeling from your weight. reactions more better than when you were in the earth. I just wanted to congratulate you on achieving this milestone in your life! After reading your writings and hearing positive comments from those who know you well, I’m sure you will find/create many more dreams to follow! I am also thrilled that your goals correlate very closely with the goals in my personal “passion.” My passion is iSPACE (interactive, Science, sPace and Aeronautics Center for Education), an emerging science center and future home of a Challenger Learning Center. We are situated in a tri-state area where we have the potential to reach hundreds of thousands of kids as well as thousands of teachers who in turn have the potential to reach many more kids throughout their teaching careers. Sort of that multiplier effect as in the movie “Pay it Forward” and a teacher’s dream! Our mantra, “Our Vision is 2020:Our Mission is Now” demands that we have a clear vision of what we need to do at iSPACE and also serves as a reminder that we need to work as quickly and diligently as possible to excite and inspire young people to pursue STEM classes and careers. I agree with you that space exploration has the potential to be one of the greatest motivational topics to engage youngsters and is a phenomenal tool that will help us identify and solve long-term and global problems. I am living my dream by traveling with iSPACE on its journey to fruition in order to make a positive impact on the kids and educators in my community. As you can probably guess, I am passionate about my work. Therefore, I do understand how passionate people such as yourself, are driven to achieve their goals. If someone is not consumed with a passion, then they cannot even begin to comprehend the momentous occasion this flight is for you. I do – so once again I offer my sincere congratulations to you! I wish you the very best on your flight and also with all of the wonderful things that are sure to follow. You have heeded Christa McAuliffe’s plea to “Reach for the Stars” – I have a feeling you will be doing a lot more reaching throughout your life. Congratulations on your successful arrival at the International Space Station. Your commitment and efforts are a great inspiration, and are yeilding a fruitful harvest for you and for the many people who are following your flight. I must admit to a bit of healthy envy, but like many, am very happy for you and share your joy. Too Cool Anousheh! I can’t wait to read your blog when you return. I understand the Soyuz reentry is an E-ticket ride. Wow. I can barely get out my front door, and there you are having the trip of a lifetime. How inspiring that is! How do you even absorb it all? When we flew together on G-FORCE One (ZERO GRAVITY B727) last year in Ft. Lauderdale, I was pleased to meet you and learn of your passion for space. After a two day hiatus it’s good to finally hear from you again, and by the way congratulations for finally making it to the ISS. I’m sure i watched every NASA-TV broadcast there was and it was good to see you enjoying yourself so much ( i won’t deny that i was envious every step of the way 🙂 ). despite everything you know about space and space travel ( real and imagined ) i’m sure being up there is proving to be quite a revelation – and one heck of a sensory experience ( did i mention that i’m a bit jelous? ). Anyway i look forward to reading about your experiences, thoughts and feelings over the next week or so, so please feel free to write non-stop if you wish. Rest assured there will be plenty of us down here hanging on every word you write. Hi Anousheh! You make my heart swell with pride for what you are doing to inspire all women to pursue their true dreams. I know you have touched my teenage girls – and they are very difficult to impress these days! I know you will enjoy every second of your trip and I hope to hear about it when you return. Eric sends his very best wishes! I love the feeling you are giving me in reading your words, and especially how we are sharing it back on Earth on this blog amongst people from so many nations that supposedly are hostile toward one another. I only know that I like how this makes me feel, which is the true person inside most of us I know. That’s more important than anything, and what I tell my children. We’re all one as you have re-emphasized with your unique view. Thank you, Anousheh. Do not disappear, the world needs you. It is a great accomplishment, to be sure. May your trip, you work, and your dedication be a beacon to all people of the ability to do so much, no matter what nation we come from, no matter what religion we believe, no matter our background, that we can all reach out to some day touch the stars. God bless, and have a safe trip and return home. Wow. That’s all I can say. You are an amazing woman. Very accomplished and nice to look at too. Congratulations and good luck with your new company. Anousheh, nice to have your first spatial post. Have a wonderful stay up there.Meantime,try not to eat spaghetti! we are tracing your trip continuously and hope for pictures of evry thing that you are watching there. I knew of you before all this started. You are the wonderful person whom sponsored so many children through Child Foundation. My husband & I have been volunteering for CF for years now & I hope to be able to meet you closely as you are my idol. I know every organization is knocking on your door, but I hope that in the near future you will accept to support CF’s new Los Angeles Chapter. I just can not imagine how your sponsored children in Iran would feel if they knew who you were. I hope you realize that you have created many new dreams for women, especially Middle Eastern women. I can not wait to see what wonderful challenges you will take on with the power that comes with this new recognition. I wish you a safe & joyful journey home & hope to hear from you. Your journey has had us to think more about the space and have more dreams for that.I’m so excited by your journey that can hardly sleep inspite of being so much tired.You have disturbed my life but this excitement worths it.I wish more people would be like you so we can taste truely the meaning of life. This is undoubtedly a turning point in your life.From now on many ones specially many iranians are eager to follow your life.They are eager to know about your next projects and activities. When you come back home,your journey must have been like a dream for you and you must be willing to exprience it again may be to a more far away place out there in the unlimited space.But some what far?May be to another galaxy?I’m fully eager to know about your next desires and aims. I hope you take exact look of any details.There are few ones who have had what you are expriencing.You might see something they didn’t noticed before.Record these invaluble moments in your mind and heart and through medias. Anousheh you are an amazing inspiration and I can’t wait to see the photos you take! You are truly living the dream and opening possibilities for us all back here on Earth 1.0! Best of luck and fair space winds! I watched the hatch opening last night (L.A. time), I was so moved by seeing you there, it was as if I could feel what you were feeling. It’s strange for me to be following so closely somebody else’s accomplishments and having such strong feelings about it, it’s not like me. But I can feel this is something so important for me and everybody in the world, people still don’t realize how much SpaceShipOne’s flight and your flight mean, It’s a pitty that so many people are not enjoying this new milestone to which your are contributing so much and are in big part responsible for. I know very soon the whole world will be talking about this new possibility of going to space! I’m so happy for you and for myself because I know now the door to space is open for all of us and all thanks to people like you who don’t fear anything, never doubt themselves and just go for it!! Thank you Anousheh, thanks for ever! I can’t wait for my flight to happen! I’ve been following your activities since you left TTI (those were great times) and your brief stint at Sonus. I can’t tell you how thankful I am to have worked with you and Hamid. What you’ve accomplished these last couple of years staring with X Prize and now spending time at ISS is nothing short of amazing and very awe-inspiring in that you’re living your dream as we speak. You continue to inspire a great many people and are truly paving the way for future ‘tourist’ space travellers. I looked at the stars this evening and thought of you, there living your dream…WAY TO GO!!! God Bless and I hope your stay at ISS is more than everything you’ve imagined it would be. Congratulations!,and the first real cyberblogger. I would begin by wishing you a happy stay in Intl. Space Station and a safe return home. I understand that you wish to translate a book to Parsi. My wife and I are professional in this task and would be more than happy to fullfill your wish! Please do not hesitate to contact me whenever convenient. عملكرد شما به مثابه اولين شكست هسته اتم مغزها و فكرها را متحول و مردم جهان را مات و مبهوت كرد و اين نظريه امروزي كه هميشه يك فكر و ايده نو وجود دارد را تداوم بخشيد به عنوان يك مرد شمارا تحسين مي كنم تمام عكس هاي شما را در منزل داريم فقط عكس خانوادگي شما را با همسرتان مي خواهم. My name is Nadir, I’m from Istanbul,Turkey. Now, I’m watching you live at ISS via NasaTv. Congratulations to you for your this great job. Have a nice week at ISS, I will be watching your mission on NasaTv. Congratulations too from the UK. I believe it is coming to an an end very soon and hope you keep smiling and enjoy the last few hours. I’m sure your enthusiasm will be infectious when you get back to earth. Watched the launch and dock and at the moment watching you type away at the keyboard so i thought i’d give it a go to say hi, well done and how wonderfull you and your familly must be feeling as not everyone actually has a childhood dream come true, so well done and congrates you brave astronaught. We have been running a blog of our own over the past couple of weeks and over 3,000 has taken part so i am passing on this message on behalf of all those who have been gripped by the past two weeks adventures. great mission!i wish you lots of joys in the space. we,Iranian women are proud of you.you did it! I don’t know why,but I think that I’ve known you since many years ago! Send more E-mails and tell us about your feelings,we want to know them! Congratulations for your trip!! It’s very nice!! I would have never imagined that one day I will write to you via email while you are in space I remember writing letters to you when we were children!!!! I used to look at the sky and wished upon a star and longing to be with my friends back home and now I am writing to you while you are with the stars WOW!! this is incredible. The sky is the limit and dreams can certainly come true as children we all have dreams and goals and you are an inspiration to us all. Wishing you and your crew a safe trip back to earth. omidvaram ke haletoon dar jaei ke hamaie ma doostdarim oonja bashim khoob bashe. shoma yekbare dige neshoon dadin ke irani jamaat mitoone bejaei berese ke tamam donya hasratesh o bekhoran . omidvaram ke shoma ra dar iran bebinam . be omid movafaghiat bishtar shoma. salam anoushe jan! omidvaram be salamat baz gardi . kheyli khoshhalam ke movafagh shodi be faza beravi . montazere bazgashte shoma hastam . vaghean khoshhalam ke mibinam yek khanom (irani) intor tonestan pishraft dashte bahsan va neshon bedan ke iraniya dar harjaye in kore khake bashan movafagh va sarafrazan va baes eftekharan! man shakhsan kheyle doseton daram ino az samim ghalb migam!!! hamishe baraton arezoye movafaghiyat mikonam. You are not Iranian, you are not American. You are from Earth. Many thanks for your note about preserving earth and peace. Not only you reached your childhood dream, but also you gave us hope, that the said impossible can be made possible keep on believing in yourself and you capabilities. how are you there!? you can see this little world from space. thats great you went from this world and watch it from there. cograntulations really.you are a real Iranian.you tried to catch your dream and God gave it to you.you deserve for it. first of all congratulations for your launch, I really cannot imagine how beautiful is Earth from so high there. I’m one of the many of our organisation who is doing his best to allow so many italian guys to fly into Space in the very near future. سلام انوشه جان. همت اراده و عزم راسخت را تبريك ميگم . نمونه اي بارز از يك انسان خستگي ناپذير و اميدوار هستي . من هم از بچهگي آرزوهايي در دل و سر داشته و دارم. تنها آرزوي من صلح و آشتي و پايان اين جنگهاي وحشتناك است كه هر روز و شب اشك من را در مي آورد نمي دانم روزي من هم مثل تو به آرزويم مي رسم. خيلي دوستت دارم و از دور ميبوسمت. منتظر برگشتنت هستم. My family and I are proud of you. I follow news about you and your space travel and we hope to see ISS at saturday’s morning in iran’s sky. My doughter took a photo for you; please prepare a facility for sending pictures to you. we love you and your nice happy face. Be success and God bless you. salaaaaaaaaaaaaaaaaaaaaaam , kheili kheili khoshhalam ke dobare neveshtehaie khodetoon ro mikhoonam!!! !man kheili shoma ro doOst daram va mesle shoma ashegh faza hastam , va arezooie ghalbim ine ke shoma be salamat az ISS bargardid!!!! conguraduation you are brave and single focused woman . We rarely see such women out there. I hope you gain wonderful experiences up there. We look up to you dear . Since you left whenever I look up to sky I see your beautiful and bright face in the sky and wish the best . You changed our point of veiw and for that reason I admire you for the rest of my life whoever does tiny think for humanity I respect . At last we are proud of you as a great lady .Please keep us posted. Ma irooniha be shoma eftekhar mikonim. We’re really really proud. Have a great day and all the best. salam,man montaghede shoma hastam!! !omidvaram inghadr shoja’at dashte bashin ke enteghade man ham bezarid!! !mesle shoja’ati ke be faza raftid!! Hello my dear.I don’t know what to say.But I want to say that I’m really happy for you,because you accomplished your dream.I love you because of your perseverance, I love you because of your trust in GOD, I love you because of your courage… At last I want to say that I hope to be happy in all your life. sarkar khanoom Anooshe Ansari,ba salam, khabar safar shoma be faza har Irani az jomle mara besiar khoshhal kard.omidvaram salamat bashi va be zamin bargardi va dar barnamehay khod movaffagh bashi. I LOVE THE WAY YOU LOOK IN THAT SUIT !!!! through our Mercury7.com website so we can get some of your photos you are taking up there for the kids to see. Lots of us are following your adventure through your blog and the NASA website. I have so much admiration for you and I wish you a wonderful trip. سلام انوشه….ببخشید که خیلی غیر رسمی دارم صحبت میکنم….چون اونقدر احساس غرور میکنم که نمیتونم اون رو تو قالب کلمات خشک و رسمی ادا کنم. نمیدونم میون اینهمه کامنت و ابراز علاقه و نظر آیا حرفای من رو هم میشنوی یا نه…..ولی بازم واسم جای خوشحالی که تونستم یه کلمه ….حتی به اندزه یک سلام باهات صحبت کنم. نمیدونم و نخواهم دونست که تو اون بالا چه حسی داری و چه احساس نزدیکی به خدا میکنی….ولی میدونم که اون رو با هیچ چیز تو دنیا عوض نمیکین….لیکن برای تو دیگه دنیا اینقدر کوچیک و حقیر که حاضر نمیشی واسه چیزی قیمت و ….تعیین کنی. چون دیگه به کوچیکی دنیا و بزرگی خدا پی بردی..حتما دلت خیلی پاک بوده که تونستی به این مقام ومرتبه برسی. دلم میخواست منم میتونستم فقط به اندازه سر سوزن اون خوشحالی وجودت رو درک کنم. تو 40 سال این هدف رو و نه آرزو- نمیگم آرزو چون انسان واسه رسیدن به آرزو فقط منتظر معجزه میمونه ولی واسه رسیدن به هدف تلاش میکنه- فکر کردی و بالاخره تونستی بهش جامه عمل بپوشونی. تو مملکتی که 2500 سال تاریخ داره…تو…فقط تو….فقط فقط تو…اولین کسی هستی که خواست و تونست خودش رو به اون ور دل فضا لایتناهی برسونه. حالا که به بزرگترین هدف رسیدی…مطمئن باش پیش خدا خیلی عزیزی…پس دعا ما هم بتونیم به اهدافمون برسیم….البته قبل از اون دعا کن که خدا به هممون اراده ی قوی و ایمان مستحکم بده تا بتونیم به عنوان ذره کوچیکی به خلق خدمت بکنیم و برای مردممون افتخار بیافرینیم. نمیدونم خیال ایران اومدن داری یا نه؟ ولی بدون چه بخواهی و چه نخواهی…تو قلب میلیونها ایرانی حشن و سروری به بلندای تاریخ به پا کردی. هر کاری میکنم دیگه بیشتر از این نمیتونم احساسم و فکرم رو تو قالب حروف ابراز کنم.ولی میدونم تو اینقدر دیدت و فکرت بزرگه که ناگفته ها رو هم درک میکنی. بعضي ها ميگويند شانس بزرگي به شما روي آورده كه به فضا رفتي. ولي مهمتر از شانس تلاش و همت خود انسان است. نام شمه در تاريخ ثبت شد و اين افتخار بزرگي است براي شما و ايران زيبا. ايران و ايراني مديون شما و امثال شما خواهد بود.شما بياري خدا به آرزوي بزرگي دست يافتي ولي ما شما هموطن عزيز را از نزديك خواهيم ديد؟. كاش من هم افتخار همكاري شما را داشتم. منتظريم كه به سلامت برگردي. همه ايران به شما دعا ميكند.خدا به همراهت. وردت را به ايستگاه فضايي تيريك مي گويم. اميدوارم كه در آنجا آرزوهايت برآورده شود. بهترین و صمیمانه ترین تبریکات ما رابه خاطر جرات و شجاعت و انتخاب جالبتان بپذیرید. من و دوستم حسین همه وقایع سفر شما را دنبال کردیم. باز هم بعنوان یک ایرانی به شما تبریک میگویم. واقعا نمی توانم احساس شما را در حین این سفر درک کنم ولی مطمئنم جدا از انچه در این وبلاگ نوشتید- در راستای مسائل اعتقادی خودتان به چیز های جدیدی رسیدید که لمس ان از روی این کره خاکی بسیار دشوارتر است.تا انچه در ان محل دیده میشود. بسیار از این واقعه خوشحالم و علاقه مندم که اگر روزی اقدام به نوشتن مسایل ماورای مادی و ظاهری کردید- انرا مطالعه کنم. از دیدن عکس شما در ایستگاه بین المللی شاد و از مشاهده علامت صلیب بر دیواره ایستگاه- از مظلومیت مسیح(ع) متاثر شدم.شما را به خدا میسپارم. ورودت را به ايستگاه فضايي تبريك مي گويم. omidvaram daste emam reza poshto panahat bashe ! Good news from the stars : a self woman made in space. Congratulations ! Thank you very much to making us dream ! Khanoome Ansari ,name shoma hamanande digar iraniani ke dar jahan esmeshan javid ast , javidan baad. Yaaaay! You have landed safely. You are so right when you mention that we, the habitants of planet Earth, have to preserve, care and protect this seemingly fragile place by all costs. How come the most “intelligent” life on Earth is also the most fighting and destroying beings? I hope you will have a good experience and a safe trip back to your fellow habitants of Earth! Now i’m writing you this comment, Atlantis have stopped at the end of the band ,And the supplyment cars try to get closer to this hot spaceshuttle. Atlantis returns safely. You’re in ISS and i’m just watching that on NASATV. baese eftekhare tamamie iranian dar sarasare donya hasty! omidvaram besalamat be zamin bazgardy. tarif konid.salamat va sarbolan bashid barayetan safar khoshi ra arezoo mikonam. Hello Beautiful Lady in Space,im very Proud of You! I’m Italian, all italian newspapers this morning have your beautiful smile in first page. at all italian space fans. در بالای سر زمین و در تنهایی برای ما هم دعا کنید و از زیبایی های خداوند لذت ببرید. What a great experience you are sure having. You are an inspiration and positive role model to girls and women everywhere. Well done. I hope you are taking a lot of pictures…and to see Atlantis reentry…awesome! با سلام خدمت هموطن سرافرازم که مایه افتخار ایران زمین است. انوشه انصاری به تاریخ پیوست و تمام ایرانیان را هم به همراه خود به تارخ کشاند . امیدوارم سفرت بی خطر و سرشار از جذابیت باشد.دعای خیر تمام ایرانیان همراه شماست. From the Earth – I thank you for your work!!!! nobody can compair too UUUUUUUUUUUUU!!!!!! پستي كه امروز خوندم ، اولين پست ارسال شده از فضا به وبلاگ تو تاريخ بود . از اين كه اين انسان تاريخ ساز ، هموطن منه و در عين حال يه زنه ، تو پوست خودم نمي گنجم . شايد خواهش زيادي باشه ، چون سرت شلوغه ، ولي تو پست بعديت يه پيام هم واسه هموطنات بفرست . Your mission inspires all of us. You have proved the value of hard working and aspiration. salam khanoome ansari.voroode shoma ro beh istgahe fazayi tabrik gofte arezooye safari bikhatar ra barayetan daram.labkhande to az har chiz ziba tar ast…oonja baraye hameye ma doa konid…rasti dar safheye avale bloget ham ID KHODETO BEDE lotfan…ma cheh joori befahmim keh comment hamoono mikhoonid? Can’t you apply for an extension (of your visa) there for another 10 days or so? or pretend you have a headache and can’t come back on time. We will get you a good lawyer to help. They can’t “deport” you, can they? I would do some thing to stay longer. Just a thought. I’m really speechless ! your act was amazing . we, IRANIAN , are all proud of you . my feeling is like when i’m reading our history of 2500 years ago. your name will remain alive in history. best wishes for you in space and on earth! خانم انصاری بابت این سفر رویایی به شما و همه کسانی که همراه شما بودند تبریک گفته وامیدوارم به سلامت به زمینی برگردید که زیر پایتان سفت باشد!!! همچنین امیدوارم سفرهای فضایی را تسهیل و با تاسیس هتل فضایی و اتوبوسهای فضاپیمای آسان و ارزان پیشرفت در زمینه تفریحات و علوم فضایی را به خاکیان کره زمین ارزانی دارید. But i think that a woman with your bright path have no needs of this. I retain that it would be beautiful to know your impressions and emotions simply as Anousheh had felt. Not Anousheh the “Executive” or Anousheh the “Engineer” but simply Anousheh for herself, because, I think that your journey was more inner than people believes.I don’t believe that you have reached the stars only because you have had money to do this or simply to do experiments, let me believe that there was something of more deep. Know your reasons and feelings, for me will be the best way to know who is Ms. Ansari and why she had reached her goals. P.s. : The little Iranian flag on your arm was the brighter sparkle of a better future for all. love you more day to day with each post of your weblog!!!! Congrat. with your dream !!! Stay safe and have a good landing in a week. it is so wonderful to see you realize your dream of going into space – you are an inspiration. also i admire that you recognize both iran and the united states as influences on your life, with both flags on your uniform. سلام و درود فراوان بر انوشه انصاری یگانه دخت ایران زمین ! نمی دونین آدم چه حالی میتونه داشته باشه که به اولین زن توریست فضا نورد و به عنوان یک هموطن !! سلام و درود بفرسته ووواون هم در حالی که در زمان سفر غرور آفرینش در فضا به سر میبره .واقعا غرور آفرینه و وصف ناشدنی !!! خیلی وقتا میشد که با خودم میگفتم کاش توی یه زمان دیگه دنیا اومده بودم چرا که هیچ دلیل خاصی برای رضایت از زندگی درزمان حال خودم نمی دیدم . اما امروز ! با افتخار سرم رو بالا میارم و با شادی و غرور وصف ناپذیر از زمین برای هموطن افتخار آفرین خودم ” انوشه انصاری ” در فضا کامنت مینویسم و از او سپاس گذاری میکنم که باعث شد از زنده بودن خودم در این زمان شاد باشم و لذت ببرم. همواره درود ما بر شما . روزبه از کره زمین – قاره آسیا -کشور ایران-شهر آبادان. من یکی از علاقمندان اندیشه ها و اهداف شما هستم. امروز در فرهنگسرای هنر(ارسباران) تهران همایش 3 ساعته ای به مناسبت سفر شما توسط پژوهشکده هوافضا ، مجله نجوم و سایت SpaceScience.ir برگزار شد. در این همایش از مسئولین خواستار دعوت شما به ایران شدم. (البته آقای تفرشی گفتند ما برنامه هایی در این راستا داریم). لطفا به کشور خودتون هم تشریف بیارید. ما منتظر سفر شما به ایران میمانیم. امیدوارم ادامه سفر شما با موفقیت کامل همراه باشد. سلام خانم انصاری وقتی پرچم ایران و رو شانه ات دیدم خیلی خوشحال شدم که ایرانی ام فقط همین! سلام تولبخند خیلی ارامش بخشی داری من او وقتی ک بر می گردی تو حیاط خونه ستار میزنم چون طاقت ندارم به برنامه مستقیم نگاه کنم سفر تو تبلور تمام کودیکی های ماست توقع جواب ازت ندارم همین که توشادی رویات شریک هستیم مارا بس.از دوست بجز دوست تمنایی نیست خیلی دوستت دارم مجید. زمين هميشه زيبا بوده تا حالا. به شرطی که روش از جنگ خبری نباشه. Hello ms ANSARI, I’m writting from France… Do you know “ANTOINE DE SAINT EXUPERY”? When I see your wonderful experience, I get the impression that “LE PETIT PRINCE” is a woman born in Iran, living in USA and offering to the Universe a so nice dream…. و امروز افتخار می کنم که من و شما ایرانی هستیم! baba hameja harfe to hast!!! vageen ke gol kashtiii..
take care.. see u in earth . بهتون نبريك ميگم.بلاخره زيبايي هاي خيره كننده اي را ديدين كه كمتر انساني چشمش به اون افتاده. انوشه جان برا ما س.غاتي بياور:يك كيلو خلائ ده كيلو بي وزني و صد كيلو آرامش.نميدونم آيا اين خواسته زيادي است? I am an Iranian girl living in Dubai. I am so proud of you! I like your smile & your confidence. I follow all your updated news everyday & email them for all my foreigner friends. It’s intresting I have a feeling like you are a close friend of mine that I am excitedly following your news. Hope you have a safe return to the earth. فکر میکنم فارسی میدانید به هر حال شانزده سال ابتدای زندگی خود را در ایران بودید. بسیار خوشحالم که یک ایرانی به فضا میرود.من تا به حال از شما نامی نشینده بودم صبح روز سفر شما به طور اتفاقی از شبکه دو سیما خبر پرواز شما را شنیدم. خانم انصاری قدر فر صت های خود را بدانید.از شرایط بوجود آمده به خوبی استفاده کنید. من هیچکدام از رویاهای کودکیم بوقوع نپیوست. من چیزی شدم که دیگران میخواستند.اما شما خودتان شدید و نتیجه آن را نیز دیدید.من به شما تبریک میگویم.شاید اگر در ایران میماندید به نتایج نمیرسیدید.ولی بدانید که هوش و پشتکار ایرانی دارید. موفق باشید و پایدارو خداوند را فراموش نکنیدو از آن بالااز خلقت خداوند لذت ببرید. Salami be sorkhie Khake Iran va be nilgoni abhaye Khalije Fars. Dear Anousheh, hi u there onboard of ISS. You know, I am going to watch ur peaceful, for now spaceland(ISS) tomorrow morning at 4:50(Iranian Standard time, 1:20 GMT), during its pass over my hometown: Shiraz. For sure u have a great great great time onboard, and we’re proud of having an Iranian up there in the space, WE ARE PROUD OF YOU, Mrs. Ansari. I hope all ur wishes onboard come true, when ur eyes be filled with tears of delight, dignity, prosperity, and pleasure when watching our so little but beautiful earth. خانم انصاري شنيده ام زمين از فضا بسيار زيباست و فکر مي کنم زيبايي اش به علت خالص بودنش است به اين علت که تقسيمات مرز ها و فقر و.. در انجا آشکار نيست در اين لحظه از شما مي خواهم در انجا آرزوي روزي را داشته باشيد که تفاوتي بين زيبايي اين کره در فضا و زمين وجود نداشته باشد. ما ، امروز در فرهنگسرای هنر تهران (ارسباران) ، جمع شدیم و همایشی درمورد سفر شما داشتیم و اوم رو کاملاً بررسی کردیم . انوشه اغي ايراني سربلند سلام …. اميدوارم حال شما خوب باشد و سختي هاي بودن در فضا بر زيباييهايش غلبه كند.گرچه ميدانم با سابقه ي خوب شما وايراني بودنتان به سختي ها به چشم شيريني نگاه ميكنيد. به هر حال اميدوارم اين سفر بار معنوي بسياري براي شما به همراه داشته باشد و ايمانتان را قوي تر كرده باشد. My wife and I are Nigerians based in Germany. We sincerely congratulate you on this your achievement Space. This was a spectacular fit by all standard and is in tune with what the future holds for a peaceful World devoid of conflict. hello ms ansari, thx a lot for sharing your honest opinion about earth views from space. i hope in coming days we all here have many other amazing details by u during your stay at space. hi ms. ansari i am writing to u from india n very pleased abt your achievement.i request u to write a little email to my address so i can also be a part of your mission this way. waiting for a quick reply from yours side.good luck n best of my wishes. الان که این چندسطر را برای شما مینویسم، در آن بالا و در سیاهی بیکران فضا غوطه ورید و زمین کوچک و آبی را خیلی سست تر و شکننده تر از هر کس دیگر میبینید. امیدوارم که زودتر از آنچه فکر میکنیم بتوان برای زندگی بهتر و سبز تر در زمین کاری کرد که یقینا حرکت و پیام شما از این سفر میتواند قدمی در این راه باشد. افتخار دیگری نیز با این سفر شما به کارنامه افتخارات ایرانیان موفق سفر کرده افزوده شد که یقین دارم اگر در ایران مانده بودید هرگز به چنین موفقیتی نمیرسیدید. بامداد شنبه، اول مهر ماه به آسمان بالای سر مینگرم و پرواز شما را بر فراز ایران میبینم و برایتان درود و سلام و سپاس میفرستم. Well done,As an Iranian woman I am so proud of you. a Conference has been held Today in Farhangsaraie Arasbaran, Tehran, by Nojoum magazine & Channel 4. انوشه عزیزم به تو افتخار می کنم. امیدوارم که به سلامتی به زمین برگردی. this is the third comment that i leave here.I live in Firoozabad,a small city in iran.we ganna observe ISS on saturday in the park at 5am!please remember us when you are crossing over iran.thanks a lot. omidvaram ke in safare fazaie shoma,tagheer dahandeh afkar manfie ma zaminian bashad. The great news is that your childhood dream coming true is now every body, especially we iranian’s joy and proud. Thank you for sharing your experience with us, as for a moment I could feel the same and it felt great. I hope every thing goes well with your amazing trip. We are all looking forward hearing more from you. Great screen shots of Anousheh aboard the station — thanks for sharing. I hope you are doing well up in the sky . I realy admire your courage and power. All of us as human might have dreams but the ones who try to make it closer to reality are winner so actually made it come true so think you showed us the way no matter how little our dream is . million thanx to you and your family who helped you in this way. please tell us about there experience you’ve gained please let us know how it feels when you look at the earth I know it’s hard to explain all about you feeling but still it’s good to hear little about that . kheili khoshhalam ke mitonam barat message bedamm . mikham begam ma inja dar ghalbe iran tehran be to eftekhar mikonim . HI.I WAS SO DELIGHTED WHEN I SAW YOUR PROGRAMS ON TV.YOU ARE AN HONOR TO OUR COUNTRY AND ALL THE WOMEN IN THE WORLD.I CONGRATULATE THIS PROPITIOUS PHENOMENON TO YOU AND YOUR HUSBAND AND YOUR FAMILY.WHAT IF YOU COULD COME TO IRAN AFTER YOUR MISSION IN ORDER TO TELL US YOUR OBSERVATIONS. I HOPE THAT YOU WILL COME BACK TO YOUR COUNTRY HEALTHY. we are proud of you and what you have done for your self and also for us and our country IRAN. I am sooooooo happy that you are safe, and hope 2 see you on tv. because i know i will never have the hounor to see you in person. how ever am glad to have this opportunety to write to you. Hope to see your name on my mails. Ba in karet tamamh DONYA be to eftekhar va Makhsosan Ek IRAN behet eftekhar meekone.Hala ke nadike khodaee… Az on bala baram doa kon. meeboosamet. kash dark konim in zibaee o va hefzesh konim hamun jori ke be ma tahvil dade shode. Hi Iam medical student. when I was 3 years old I whish that I could be an spacewoman and when I heard about you I become so happy and we all proud of you. I heard your talk in Night Sky program from Channel 4 of Iran TV. I live in Tehran. That was a really inspiring talk. I am proud to hear your point of views about your goals and your messages for the people (especially the young iranians). I was counting the minutes to see you on Nasa TV while getting into the ISS. It was a milestone in my life. I can not declare how much I want to see your successful return to our home; earth. What a thrilling adventure you’re experiencing out there in the big void! I hope you are fine and able to enjoy it completely! I’ve read the best way for you to see the milky way is to go inside a Soyuz capsule, turn all lights off, wait for the station to be in Earth’s shadow and look through its small window. Be part of the big picture. On tuesday morning, ISS should become visible from Belgium. I’ll think about you. There you go girl. I am proud of you it doesn’t take just money to make this trip it also take vision, generosity and being a very brave person to sit in that contraption. I hope when you get back you are not all spaced out ;-)! I’m from Mexico and i just wanted to congratulate you for this incredible adventure that youre living out of space. I admire and respect you because you put a lot of effort to acomplish the training for this journey. My best wishes…and remeber…even in the space…….There’s a natural mystic blowing through the air; If you listen carefully now you will hear…. I’ll stay aware of your blog to know about your magnificent trip…TAKE CARE. I,m italian, all the italian newspapers in the first page this morning having your smile in the space. Please a message to the space italian fans? Would it be possible to contact you by a easier way? Hi,I`m an iranian girl and i hope you will be happy there,I love you soooooooooooo much,we are very proud of you,I cant explain my feelings about you,Ijust can say I love you & I try to be like you. برات آرزوي موفقيت در تمام عرصه زندگي رو دارم. بيشتر از اين مزاحمت نميشم. اون بالا مواظب خودت باش. بدون كلي ايراني منتظر برگشتن توست. خدا نگهدار. pedare man doctor motekhassese maghz va asaab fareghottahsil az daneshgahe tehran ast va oo shadidan be fekre ayandeye ma mibashad ma ta konoon be chandin keshvare donya baraye kar rafteim vali anha madrake(degree)iran ra ghabool nadarand va man ba khod fekr kardam shayad shoma betavanid be ma komaki bekonid zira man taarife shoma ro dar chandin shabakeye khabari mesle voa,khabare iran va gheyre shenide am. I don’t know if you read this at all. We are proud of you. Only a smart Iranian girl can come up with such a great idea and accomplish that. You gave hope and self confidence to many people including women, Iranians and Americans. You gave the best message of peace to this crazy world which is full of hate and war. Appropraite words cannot be found to express our feel of pride as the first Iranian is going to space. May your magnificent job be a start for further progress in the area. These comments have all been sent to Anousheh — please leave new comments on a recent post where comments are still open.